More 1 stars chefs here. Other Spanish chefs here. First of all, Paulo Airaudo was born in Argentina to a family of Italian immigrants. Since he was 18, has worked in many parts of the world (Mexico, Peru and many European countries). Later, in Europe he gained experience in restaurants such as Arzak (3*Michelin) in San Sebastián, The Fat Duck (3*Michelin) near London and Magnolia (1*Michelin) in Italy. Then, in 2015, he co-created La Bottega – a forward thinking modern trattoria in the historic part of Geneva. Most of all, only four months later the restaurant received its first Michelin star. 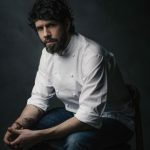 Now Paulo Airaudo has finally opened his signature solo restaurant in the heart of San Sebastián where his European adventure originally began. At Amelia Paulo Airaudo does not only pay homage to future generations, but also the past. Indeed he cites his grandparents as a huge inspiration for his fascination with cooking. 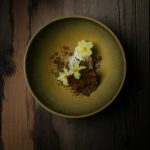 After over a decade of cooking and seeking culinary excellence nomad chef has finally found his home – even naming the ambitious endeavour after his 2-year-old daughter, Amelia, which means this time he’s here to stay. This time it’s personal. There, from scratch, he created an ambitious dining project. And remarkably early has earned his seat at the coveted high table of grand chefs and restaurateurs in one of the most recognised culinary destinations of the world. On Wednesday November 22nd, the grand gala of Guide Michelin Spain & Portugal 2018 was held at a full Ritz-Carlton in Tenerife, Canary Islands, recognising the absolute best restaurants of the Iberian Peninsula and territorial islands. Here Amelia was one of 17 Spanish restaurants that received a first Michelin star. The only newcomer accoladed with a such in San Sebastián. But Argentinean-born Paulo Airaudo has managed to do so with an impressive dedication and within just two months in early 2017. Indeed, he transformed an old timber wood shop into a two storey full throttle restaurant in the heart of Zona Romantica. 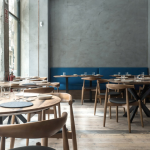 A restaurant designed with gray tones and natural materials such as wood stand out and is characterised by its minimalist, almost Nordic approach. Yet, it is also flavoured with comics art, tiny Mario Bros figures, Star Wars paintings and gadgets that refer to Pop Art culture and the early 90’s when Chef Airaudo grew up. Amelia serves a frequently changing and very personal 10-course tasting menu. 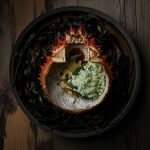 It is combining different flavours, textures and memories gathered through more than a decade of cooking and seeking culinary excellence all over the world. An otherwise restless culinary nomad has found his home. So personal that he has named the restaurant after his, then, 2-year old daughter, Amelia. The seemly quick road to success has not been easy – but without any comprise, also resulting in creative acknowledgments. Such as from the association with JRE (Jeunes Restauraneurs) and Euro Toques Spain , and invitations to participate in significant events such as the inaugural dinner of San Sebastián Gastronómika. 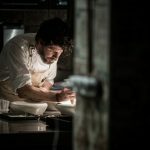 Also the creation of the pre-launch dinner for “Michelin Stars – Tales from the kitchen” during the San Sebastián International Film Festival. Also cooking at BBVA Bilbao Food Capital 2017 or the “Celebrity Chef Series” in Bahrain. Not to mention that Chef Airaudo himself instigated “San Sebastián Dinner Series”. 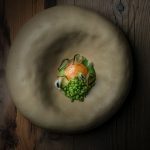 Six collaboration dinners extraordinaire a year, inviting a diverse range of interesting chefs from around the world to cook in Donostia.